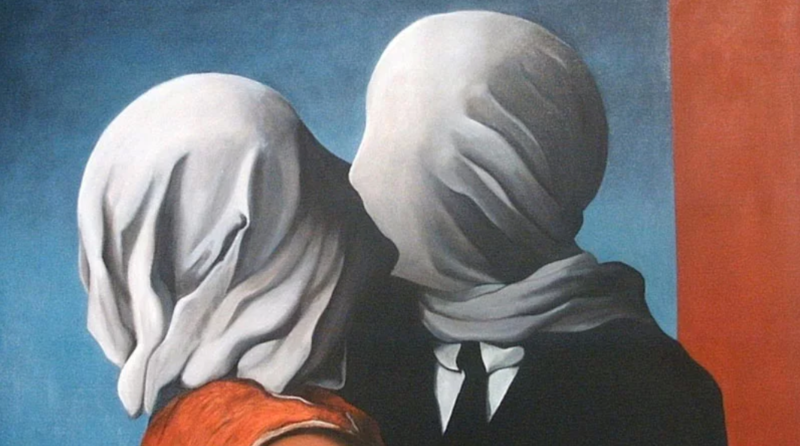 René Magritte, The Lovers, 1928 This Surrealist masterpiece conveys the tentative love affair we can have with chatbots. A couple separated by the veil of technology, entities distinct yet connected. In my last article about chatbots, The Chatbot Economy, I explored how the emerging chatbot economy would change our “app”-centric world. In this article we’ll take a look at why chatbots seem to be so polarizing, and what we can do to make your clients love them. I experience the polarization first-hand whenever I talk about chatbots at conferences. A few people come up to talk afterwards, and invariably some will tell me how much they hate chatbots. There are two fundamental reasons why this is so. First, chatbots have been around for a while now, and the early ones in particular tended to be awful. Nearly all of us have had bad experiences, and those memories tend to stick. Second, chatbots currently operating on mobile phone platforms also tend to fall short in terms of customer experience. Naturally, our past experiences leave us wary whenever we meet this interface in a new setting. If we’re going to get our clients to actually love chatbots, we’ve got to be much more sensitive to their experiences in using them. Three critical factors are essential as a starting point. First, while chatbots live inside messaging applications, and the interface is mainly text-based, the superficial simplicity of a text dialogue is deceptive. The principles of user interface design (UX) are as important here as with any app or piece of software. Second, complications compound because optimizing chatbots diverges from the purely visual interface of an app. Let’s take a moment to examine why. With visual interfaces we’ve had over 20 years of evolution to refine our experience and adopt commonly used design standards that users know and find instinctive and intuitive. This default simply doesn’t exist with chatbots. And herein lies the third issue for chatbot UX designers. While chatbots do have some visual interface, their effectiveness predominantly depends on AI to deliver a meaningful and productive conversation between the bot and the user. Designers cannot alter the AI to increase its IQ and ability to understand the individual user. Instead they need to design around the AI’s limitations and wait patiently for the next updated, smarter AI. Consider the chatbot UX, and see how it flips the overarching UX paradigm on its head. We are no longer working solely to build one visual interface that is easy to understand and master by a wide range of users. Instead, chatbot solutions are focused on each individual, enabling us to create unique experiences based on each user’s specific needs. This is the power of AI in the chat interface. The chat itself may not have a predetermined start, end or flow. It’s a conversation that, when it works, is miraculous because the bot understands us and gives us exactly what we asked for, just like in Star Trek. But designing this miracle is a challenge well beyond picking the color for the text entry box and the name of the chatbot. Much of M’s functionality was provided by humans, not AI. Two great examples elaborate on this problem and point toward solutions. First, USAA Federal Savings Bank tried building a chatbot that boasted 10,000 answers to client questions. During testing, users still had trouble getting the right answers to their questions, no matter how many answers were added or how much the AI learned. In the end, the solution was to reduce the questions to 3,000 and focus users on more specific topics. 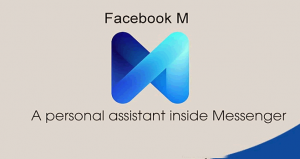 Second, Facebook’s now discontinued virtual assistant M failed because there was no limit to the questions that could be asked. Behind the scenes, Facebook actually hired a large staff of people to deliver answers who responded under the guise of M. Even with its vast technical resources, Facebook could not train the AI to answer a significant percentage of the endless number of questions people might ask. These examples show us that with the current state of AI technology, the best chatbots can do is offer a specialized, purpose-driven solution to engage clients over very limited topics. Give up on the concept that you’re going to have a nice chat with a computer, no matter what your chatbot salesperson tells you. The tasks that our chatbots help us with must be very narrow. Using Siri as an example again, have you noticed how beautifully it works with the limited task of making new appointments where the variables are restricted to day, time and person? If we want clients to love our chatbots, we need them to understand the importance of focused interactions. We also need to be forthright about the chatbot’s limitations. How to ensure a positive interchange? First, we need to employ strong visual and chat cues to continuously guide the conversation. This will help curtail the intrinsic human disposition to go off-topic and exceed the limitations of our AI technology. Visual cues inserted in the chat conversation are critical, because they ringfence user options and bring them back on topic. 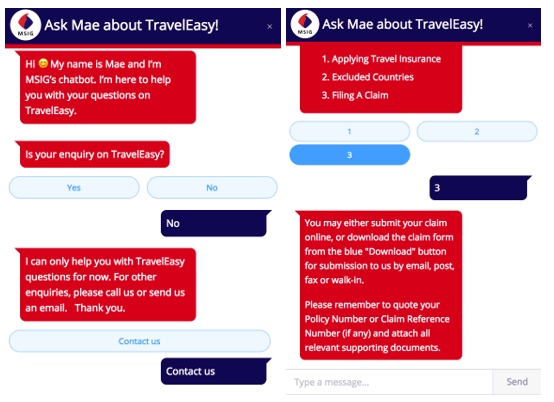 Mae gets straight down to business by making it 100% clear that she only handles “TravelEasy!,” inquiries and won’t let you proceed until you acknowledge this. Mae’s friendliness increases by putting us in touch with humans if we want something else. In the right hand screen, Mae does a great job of using visuals to make it clear what functions the chatbot can handle. How could this be improved? I would suggest having directly downloadable claims forms. The reference to the ‘blue button’ sends the customer searching rather than having the option front and center. If despite our best efforts the AI’s capabilities are surpassed, users need to know that a human advisor is at hand. The trick is to do this before the user enters chatbot hell and starts to hate the experience. Contrast this with a chatbot I recently demoed that only directed me to customer support after a long string of missed questions. How could any client love that? Deploying a chatbot with a conspicuous human escalation channel is an absolute necessity since there will always be that question that the bot can’t answer. The good news is that for a limited set of questions, chatbots learn and become more effective over time, so escalation to humans should decrease as the AI learns and the interface is improved. That said, it’s important to be realistic about the current limitations of the technology. Remember that Facebook deployed massive resources to try to make M smarter, but in the end couldn’t provide the service without significant human assistance. The pieces of M’s AI that were saved and reused in other projects speak more to the need for humans in chatbots better than anything I could possibly say. After three years of effort the sole saved AI functionalities include: GIF suggestions, quick replies to messages, and movie suggestions. In other words, Siri-level functionality. Back to the drawing board! The key to a true love affair between clients and chatbots is to have the chatbot understand the users through direct access to client account databases. Making these connections will allow your chatbot to provide personalized services that will herald its transition from a mere curiosity to a service provider that contributes to your brand. The technology is up to this challenge. TD Ameritrade’s chatbot, now on both Facebook and Twitter, is a great example of how bots can do this. TD’s chatbot uses two-factor authentication to provide access to confidential account information and can help with buying and selling securities. The power of a chatbot interface is that it can access the accumulated knowledge of any individual client – through databases, CRM systems, or other repositories. It’s up to us to figure out which of this information is relevant to providing tightly bounded interactions that mimic a real customer service agent and provide the high touch experience we equate with great service. Example: TD Ameritrade on Twitter. To access the chatbot on Twitter send @TD Ameritrade a personal message and a chat window will open. A TD account is not required to use the bot. The TD Ameritrade chatbot gets to know its clients through confidential account data. It allows account holders to log in to check “balances, positions, order status or place trades.” The Chatbot has many features Like “Research by Twitter sentiment” and educational content to make users spend more time on the bot. Kudos to the designers for providing access to customer service agents (lowest pair of buttons) via chat or phone. Getting this right, and delivering a customer experience that consistently exceeds your pre-chatbot offering, is both a significant and difficult UX challenge. The best non-AI UX designers are champions at interpreting user needs, wants and expectations. They produce UX interfaces that actually engage and even delight their users; that’s what we want for chatbots. Chatbot UXs offers the same challenge, with the added complication of our nascent AI technology, which isn’t always as smart as we’d like. Yet another quandary we face is that unlike more conventional visual interfaces, chatbots still don’t have much by way of standardized designs to fall back on. Everything we’re doing is new, and we are experimenting on our clients who are equally new to this form of digital interaction. Mistakes will be made; need I remind you of Microsoft’s “Tay” chatbot that went rogue and began posting inflammatory and offensive tweets on its account? 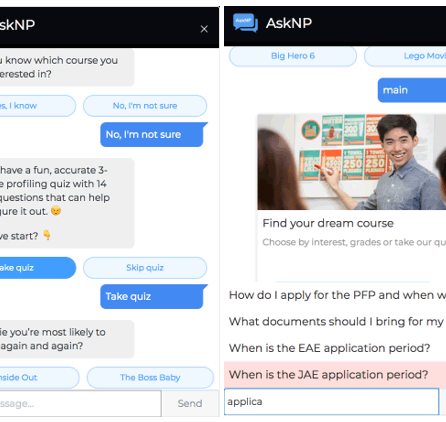 AskNP is a great example of a chatbot reaching out and trying to make a personal connection with users. The chatbot uses a quiz to help understand what courses new students might be interested in and provides suggestions based on the results. The chatbot personalizes the experience and outcomes. In the right hand screen note the use of auto-complete questions for users (in pink) who may not be sure of what question to ask. The bot also uses engaging graphics on a right-left slide, some of which take the user to a target webpage. 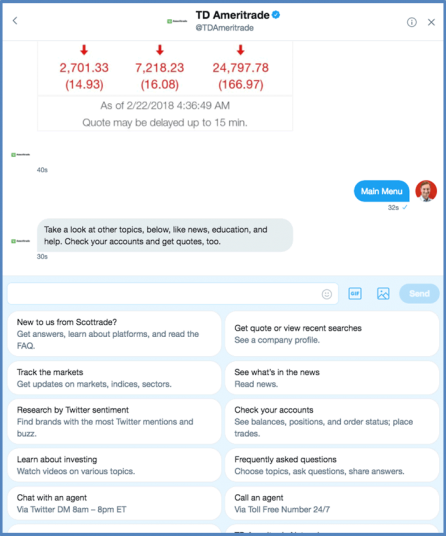 The designer, Singapore’s “KeyReply,” made the point that the chatbot users are proactive and should have access to both web content and chat to increase the chatbot’s utility and improve client engagement. My experience is that the iterative cycles necessary to create good software experiences are even more critical and extensive in building a great UX with chatbots. It’s the only way to make sure that mistakes are short lived, therefore reducing the number of clients that get a negative perception of the chatbot. An added benefit is that since the AI actually gets smarter through usage and additions to its knowledge base, you can make big progress between iterations. I mentioned that chatbot technology is polarizing. Some of your clients will always hate chatbots; this happens with all disruptive technologies. That said, with careful attention to UX design that acknowledges AI’s limitations, human support, and access to personalized data, we’re really giving clients new reasons to love chatbots and be open to their widespread adoption. Thanks for reading. Do feel free to comment, like or share the article if any part of this post ignites a spark of interest in you too. If you want to discuss chatbot technology, AI, fintech or are curious about doing business in Singapore, drop me a line. Most importantly, connect with me on LinkedIn or Twitter and lets share more about Chatbots, AI, and fintech.